many years ago, i went to a Bible study taught by a family friend, Cathy Baker. i can't remember exactly what we were studying, but i remember that she handed us a sheet of paper that said "dagger list" on the top. she then explained, on the left side of the paper you write constant thoughts, doubts, fears, etc. that you continue to struggle with. on the right side of the paper, you write verses that speak truth on that particular subject. you keep the list in your purse, wallet, etc. so you always have it with you. then, when you are struggling with one of the items, you pull out your dagger list & use those scriptures as daggers to kill that thought with the truth. this has always stuck with me because i am an over-thinker & over-analyzer. 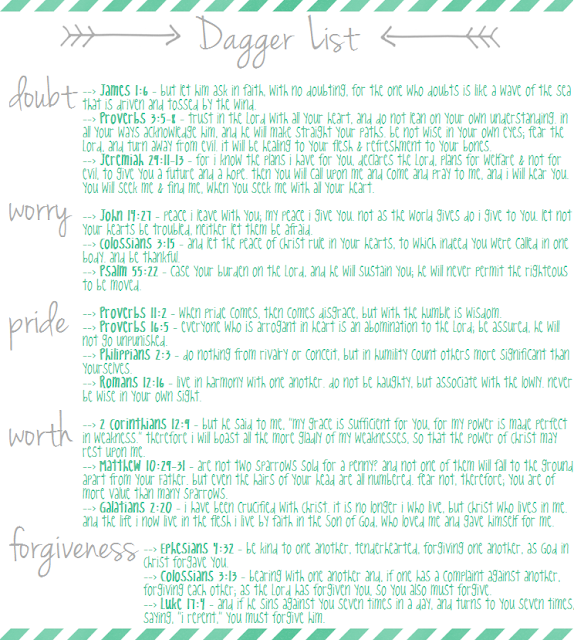 the dagger list has proven to help me take my thoughts captive to Christ. it's neat & very handy to already have defenses in place for things i struggle with. that way, i can just pull the list out & i already have specific truth right at my fingertips. friends, there is a war going on everyday & whether we realize it or not, we take part in it. it's a war not of flesh, but of spiritual things. the struggle is real & we need to have defenses ready before we ever engage in battle. think of a tree for a second, if you will. if a tree has shallow roots it can stand up, yet when a storm comes most likely it will fall because it's not prepared with deep root defenses. yet, when a tree has deep roots & is prepared before the storm, it stands tall even through the hardest of storms. that's how we need to be, we need deep roots that are rooted in Christ & his truth. in the middle of battle is not when we need to worry about our defenses - they need to be prepared before hand. 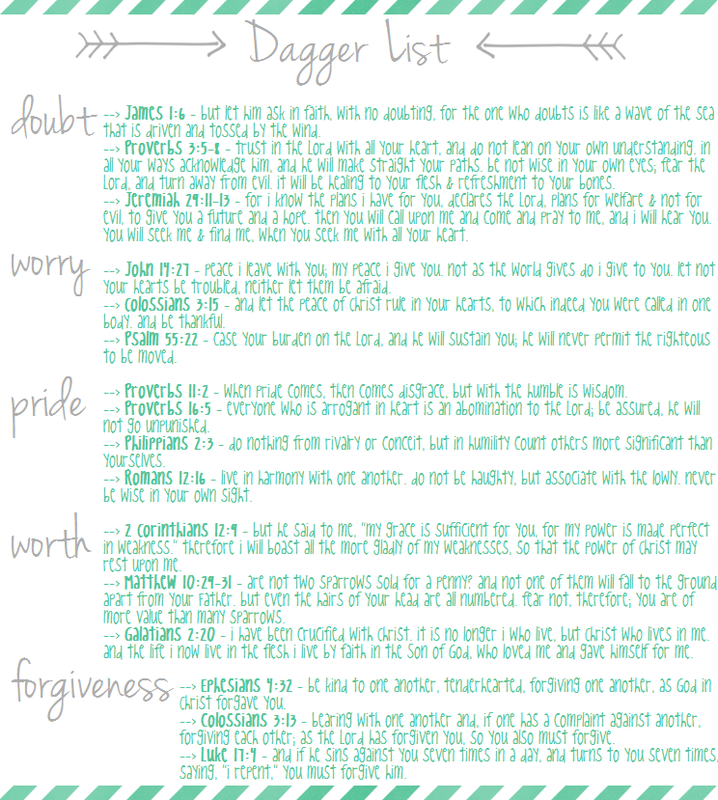 i encourage you all to make your own dagger list & use it to speak truth into your life! below is a glance at the first page of mine! I love the idea of a dagger list!!! This is fabulous! This is such a fabulous idea! Thank you for sharing your "dagger list" as an example. I can't wait to get started on mine! Thanks for the inspiration. I love this idea! It's definitely something I need for those moments of stress and doubt. I'm definitely going to share this with my Bible study girls. P.S. Made your Chicken & Vegetable Nicoise for those girls and we absolutely loved it! I'm passing along the link to one of them. Thanks for sharing! Love these verses! Thanks so much for sharing! thanks, friend!! i was recently reminded of this & definitely need this each day! aww, thanks Jenny!! this is definitely something i wish i would've had in those younger years!! and still need today!! i'm so glad you made it & that ya'll loved it!! :) thanks for letting me know how you liked it!!! Scripture is the best weapon for those persistent thoughts and issues that seem to come up again and again! I'm so glad God gave us His Word to fight them! i am very glad too, Rachel!! :) it is the best weapon!! What a great idea! I love this. I've been doing a lot of scripture memory in my Bible study right now, and I have found that verses come to mind that fit with what I'm struggling with. It really is a great weapon we have against these fears. ahh isn't it so cool how God designed the Bible to be living truth & our greatest weapon? !